Late one night, midway through Whole 30, I was hungry and poking around the kitchen. I didn’t have a ton of food in the house but I was able to hodge-podge together a tuna salad that my husband has since requested I make again. Then ate the whole batch in one sitting for dinner. 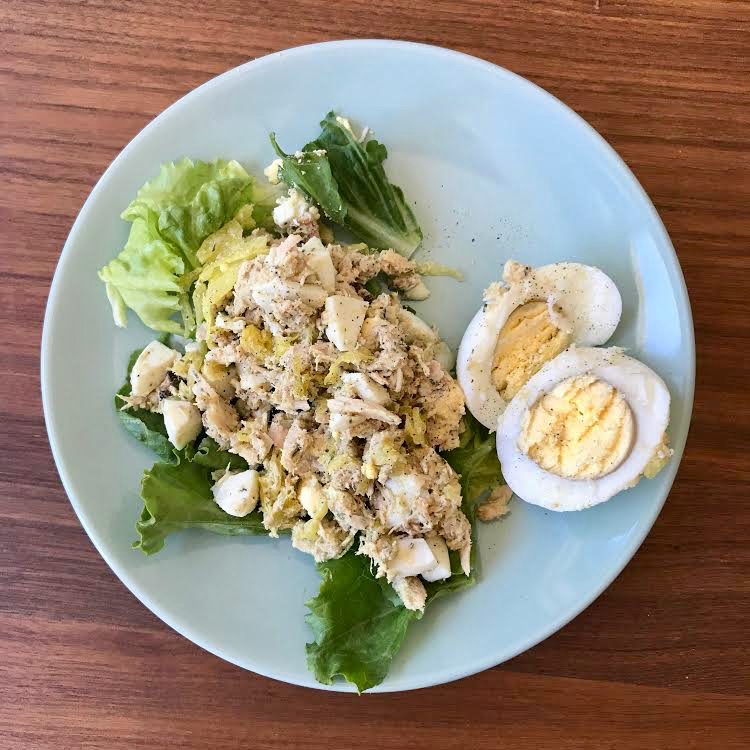 Mix together one can of tuna, 2 chopped hard boiled eggs, 1/4 cup kraut (I used the Emerald City Flavor), 3 slices chopped bacon, about two tablespoons of Cilantro Lime Tahini Dressing, a light drizzle of olive oil, and a dusting each of pepper, dill, and celery salt to your tastes. It has been so hot in Seattle that this is a perfect cold lunch or dinner with minimal effort. You could serve it with salad, a few cornichons, or an egg if you want even more protein. When I can eat bread again I bet it’ll make a great sandwich too. If you’re curious about the cilantro lime tahini dressing and don’t want to commit to the full recipe, I made a half-batch with my immersion blender the first time and it worked great. As Alex says in her post, it is extremely versatile and you can put it on, in, or next to just about anything. I just used it to top a hard boiled egg along with some salt, pepper, and green onion. Bon appétit! You could serve it with salad, a few cornichons, or an egg if you want even more protein.